Our monthly Full Moon Dinner are special pop-up dining events in Cruz Bay with unique themes and one night only menus inspired by the full moon. 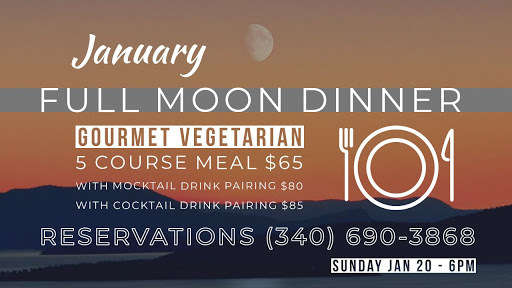 January is our VEGETARIAN Full Moon Dinner for those who want to start off 2019 on healthy and delicious foot. The theme of January’s Full Moon Dinner is PACKAGES & PARCELS which inspired Chef Lori’s Gourmet Vegetarian menu (below). PLUS 2 SURPRISE COURSES unveiled by Chef Lori during the Full Moon Dinner.